I worked on Paradise Lost on Friday and Saturday. I finally finished the big tree in the middle!! Not sure what I'll work on today. I may get back to the Anniversary Houses or maybe work on Paradise Lost some more. I would love to get it finished this month. Write soon!! Beautiful work Nicole. I love this piece, especially the animals. Have a great stitching week!! This is really coming along; Love that wacky pink peacock! The tree is lovely - great finish on it! 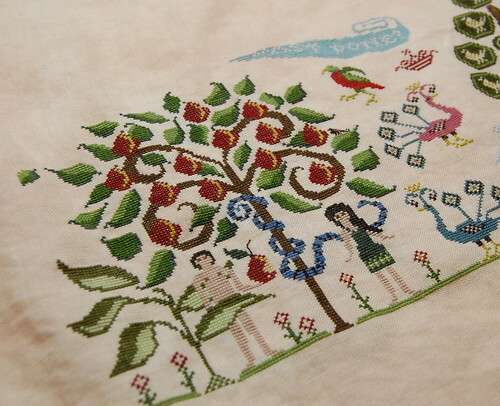 So you have Paradise, Shores, and Sarah Woodham all started - do you stitch anything small? Those are all very large and you just finished Christmas - going to start Autumn? It's smaller kind of. Happy Stitching on all of them as your work is beautiful! Such beautiful colors, and yay about the tree being done. Loving Priscilla and Elvis here! I really love how vibrant the colors are in this. It's beautiful! Wow!! It looks amazing!!! Congrats on finishing that big tree. Beautiful! The colours must make anyone happy! Looking great! It makes me want to pull my chart out, kit it and start stitching myself! It looks wonderful Nicole. You would think that this would be somewhat of a quick stitch, but I'll bet those trees are a bit of work. But it looks great! That tree drove me crazy only slightly less than the tree on the right. :) Great work, Nicole! Your stitching piece is beautiful! Looking good! I always enjoy seeing what you're working on! PL is looking so great! It's looking fabulous Nicole. It's always a pleasure seeing what you've chosen to stitch next. Lovely Nicole! So stinkin' cute. We are doing opposite sides! I can't wait to stitch the lions. Keep going on PL! Happy Stitching! That tree looks really pretty! I was about to start on it and got sidetracked. Yours makes me want to get it out sometime too. Love this one!! It's beautiful! Keep going, we want more! It looks great, Nicole! It's such a fun stitch. I love seeing what you choose to work on! Paradise looks great!! Very colorful! Great progress Nicole - it looks beautiful! Wonderful progress Nicole. Won't be long before it's finished!! This work is amazing!!!! Your hands must be magic and the colors are wonderful. The three is really perfect. Keep on stitching! Bye, Clara.